Barcelona started with one of the strongest line-up available. In recent week, the entire debate has been surrounding on whom of Dembele or Coutinho should Valverde pick! And this match in a positive way increased his head-ache. After the recent matches of getting sidelined, Coutinho got a rare start ahead of Dembele. And one has to admit, that he didn't disappoint! Coutinho started on the left of the front trio in a 4-3-3 formation alongside Saurez in middle and Messi on the right. Arthur, Rakitic and Busquets formed the midfield. Throughout the match, Coutinho was brilliant with his use of skills. One of the biggest criticism about him is about his tendency to overdo things. Being a Brazilian, it comes naturally to him but in this match, he showed exceptional control. Once again, we were able to see the exceptional linking up between Messi, Saurez and Coutinho upfront. When you add Alba also storming on the left, this link ups should create havoc among opposition regularly. It is safe to say, Coutinho was the best Barca player out there along with Saurez in the first half. There are many ways you can recycle, you may either take the item to your local council recycling site or we offer a free 'Take Back' scheme, this is done on a like for like basis. You have 28 days in which to do this and must include details of your purchase from our online retail site. The two combined brilliantly tow produce the opener in the 20th minute, Coutinho won the ball just outside the box, shuffled it to Saurez who did brilliantly to curl the ball past the keeper. It first appeared across for the onrushing Coutinho, but the finish from Saurez was from some other world. Barca never looked giving up the lead after that. A scoreline of 3-0 never meant Barca played Eibar out of the pitch. They remained competitive throughout the match, but Barcelona was too solid to concede. 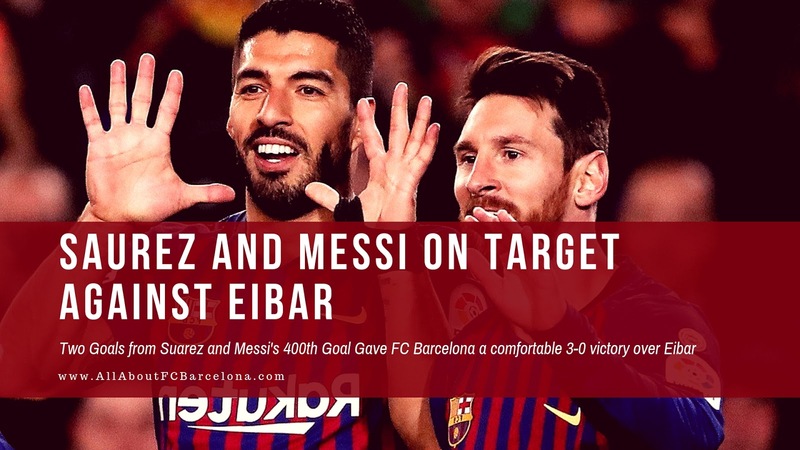 And to make matters worse Barca was brilliant in the way they upped the ante when it mattered and Eibar was completely shut out of the match in a brief period of time. This season, Barcelona always had a tricky start after the break. Opposition teams normally raised the tempo at the start of the second half and Barcelona has suffered numerous setbacks in that period. But this match was different from that. In a brief fifteen minutes of period Barcelona just raised the tempo, completely shutting Eibar out of the match. It was quite strange how the scoreline remained 3-0 after that, it could have gone to 5-0 just like that. First in the 53rd minute Lionel Messi made it 2-0 scoring his 400th La Liga goal in his wonderful career. Then in the 59th minute, Saurez showed why he still remains the no.1 striker in the world, producing another magical finish. Saurez has started 2019 in spectacular style, with a stunning volley in the last match and two cheeky finishes in this. Barcelona then slowed down the game and we had a subdued affair for the rest of the match. Even then we could have increased the deficit but the final ball was always lacking. That is no matter for concern as we showed tremendous control over the way we ran the match. So for the second match running in La Liga, Barcelona has their two talismanic forward - Saurez and Messi scripting the victory.